After a week of fielding repeated questions about Kevin Durant (and deflecting them with everything from details of his nightly routine to a simple “That’s cute”) Russell Westbrook went off Friday night. 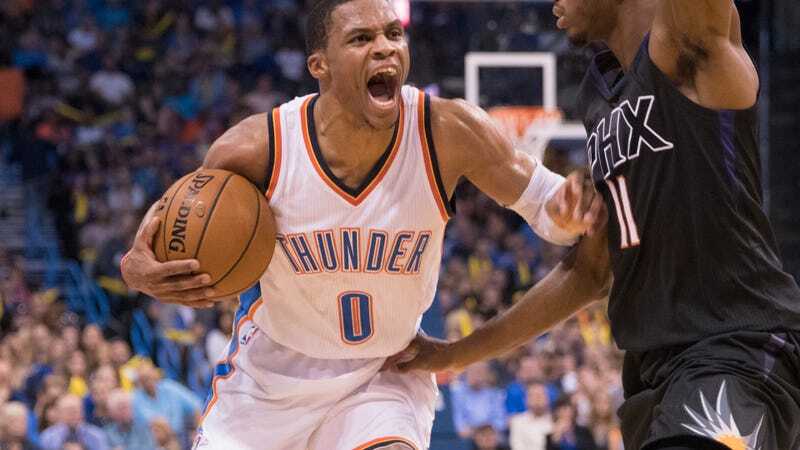 Westbrook had the NBA’s first 50-point triple-double in more than four decades—51 points, 13 rebounds and 10 assists—to lead the Oklahoma City Thunder to an overtime win against the Phoenix Suns. On a career-high 44 shots, Westbrook scored more than twice as much as any of his teammates and was the only member of the Thunder with more than two assists. Westbrook started off the night cold and the Thunder trailed early, down by 15 points at the end of the first quarter. They closed the gap to four points by halftime, but still with total first-half shooting of only 4-for-16 from Westbrook. From there, Westbrook looked far more solid, going 13-of-28 in the second half and overtime. The result was the first 50-point triple-double since Kareem Abdul-Jabbar in 1975, and the highest-scoring one since Elgin Baylor in 1961. Victor Oladipo was the only other Oklahoma City scorer in double-digits, with 21 points, while Andre Roberson added 11 rebounds. Depending on Westbrook to explode with near-historic stat lines is not exactly a sustainable long-term strategy for Oklahoma City. But it can be fun as hell to watch.